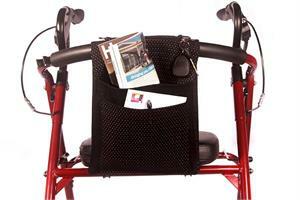 The Grab and Go Bag was developed for the mobility device user who wants to easily take their bag with them. This bag features a unique easy off and easy on saddle bag construction. Made from a heavyweight Black Fleck fabric with easy lift handle, roomy 8"x7.5" pocket, zippered 6.5"x4" security pocket and hook and loop patch for security. D" rings on the side of the handle allow for attaching your own strap.